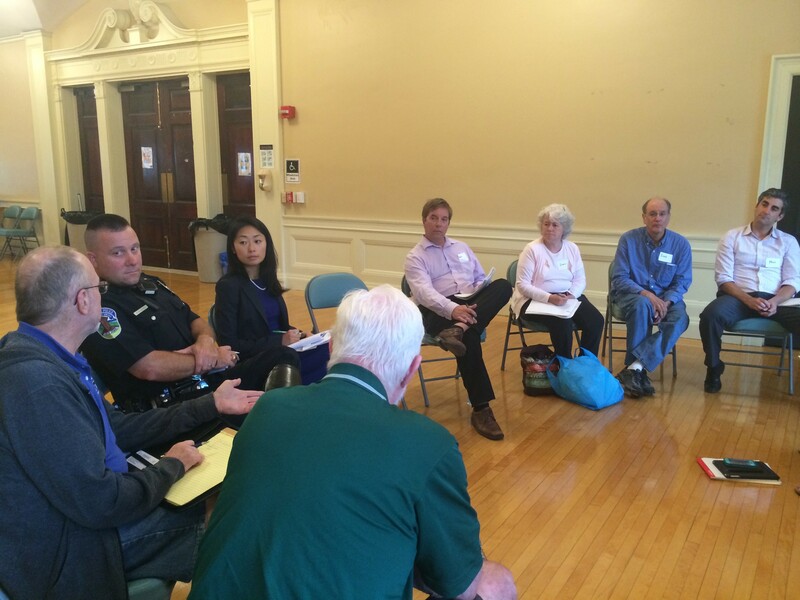 On Wednesday evening, the mayor, a cop, a city councilor, a couple of longtime taxi drivers, an Uber lobbyist and several others sat in a half circle talking about how Burlington should regulate taxis and other cars for hire. The public meeting — the first of three — marked the beginning of the city's efforts to revamp the ordinance governing these vehicles. Burlington's city council rewrote this ordinance in 2009, but the the arrival of the ride-hailing company Uber, coupled with complaints about ineffective enforcement, prompted officials to undertake the task a second time. Chief administrative officer Bob Rusten told participants that the goal this time is to create an ordinance fit for the 21st century. Splitting into two groups, the attendees discussed some of the sticking points about Burlington's current regulations. Local cab drivers have been fiercely critical of Uber, which began operating in Burlington last fall and recently entered into a temporary operating agreement with the city. But on Wednesday, Uber reps and local cabbies sat next to one another, along with other stakeholders, and contemplated what regulations their services require. Fred Solomon, a longtime cabbie, suggested that Burlington should conduct background checks on all vehicle-for-hire drivers, including Uber's. The company currently conducts its own. Laura Shen, an Uber rep, responded politely that outsourcing that responsibility to the city was likely a "nonstarter" for the company — a phrase she would repeat several times during the discussion. The group contemplated whether the city should eliminate the requirement that all taxis charge a standard meter rate, which some drivers allegedly manipulate. And it considered whether traditional taxis should be able to adopt Uber's "surge price" strategy — a controversial policy that consists of jacking up prices when demand for rides is high. Weinberger's suggestion was met with silence. "Well, there's a hot one," said city attorney Eileen Blackwood, who was moderating the discussion. Traditional cab drivers seemed a bit taken aback. After a moment, Shen responded, "So, I think Uber doesn't love that." Shen clarified a moment later: "It could be a nonstarter for us."